A leaky gut syndrome diet is never without fiber-rich and anti-inflammatory foods. You might have overused antibiotics in the past or have been exposed to too much antibacterial products. 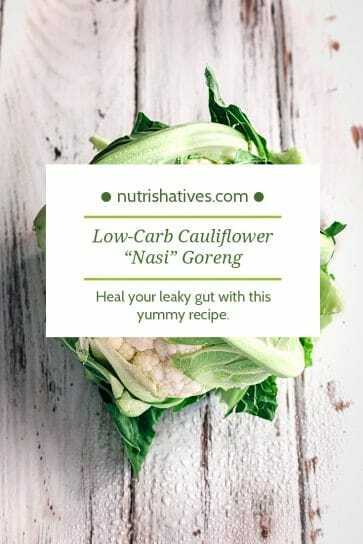 Whatever gut-damaging factors you’ve unfortunately exposed yourself to, the Nutrishatives Team is here to help you heal your leaky gut syndrome with these two gut-healthy recipes. Sourdough bread may have similar amounts of calories, carbs, and fiber as a regular slice of white bread. However, it has less sugar and more protein because it is made with no sweeteners or oils. More importantly, sourdough bread is fermented using yeast and Lactobacillus cultures (a bacteria that’s good for your gut that you can also find in pickles, kombucha, kefir, and sauerkraut). During the fermentation process, these Lactobacilli bacteria produce a molecule called lactic acid. Lactic acid neutralizes a group of molecules found naturally in wheat flour, called phytates, which normally bind up vitamins and minerals and make it more difficult for you to absorb them. This means that it is easier to absorb nutrients from fermented sourdough bread than traditional wheat breads. Additionally, the fermentation process lowers sourdough’s glycemic index (GI). This makes it one of the best bread choices for those following a diabetes-friendly diet. 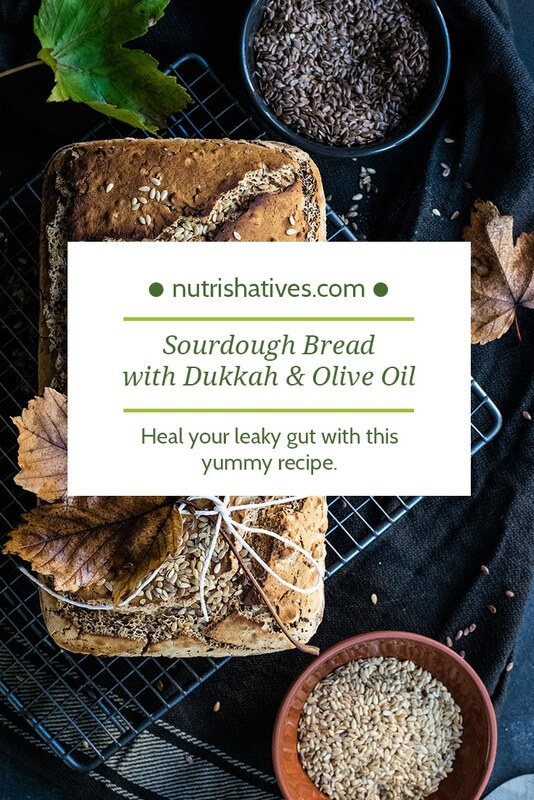 In addition to the health benefits of traditional sourdough bread, we’ve upped the ante in this sourdough recipe by adding Dukkah, an Egyption spice mix that includes two seriously gut-healthy spices: fennel and turmeric. Fennel seeds can ease your digestion and relax the muscle lining of your digestive tract. This makes fennel a powerful spice for easing bloating. Turmeric contains the phytonutrient curcumin, which has been shown to have powerful anti-inflammatory properties that top even those of common anti-inflammatory medications, such as Diclofenac. Spread the almonds in a baking tray. Roast for 8-10 minutes in medium heat (350⁰). Place the cumin and coriander seeds in a dry frying pan. Cook over high heat until fragrant. Make sure they’re cooked evenly on all sides by shaking the pan every so often. 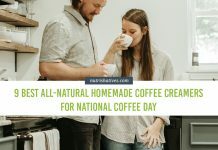 Pour the cooked cumin, coriander, and fennel seeds into a coffee grinder or food processor. You may also use mortar and pestle to crush the seeds. Don’t overdo the grinding; you want your dukkah to have a little texture, so don’t grind the seeds to a powder. Place them in a bowl when done. Chop the roasted almonds and stir together with the ground seeds, turmeric, and sesame seeds. Rub slices of the sourdough bread with the cut side of the garlic. Char-grill until brown on both sides. If you don’t have access to a char-grill, use a heavy, cast iron pan with ridges. Preheat and grill the bread as you would on a charcoal grill. Serve with the bowl of dukkah for dipping. Quick tip: Leftover dukkah? 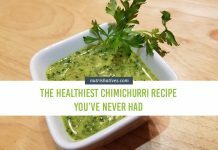 Mix it into some hummus for a delicious spread! Nasi Goreng is an Indonesian fried rice dished. It’s traditionally made using margarine, sweet soy sauce, shrimp paste, chili, garlic, and other spices. The problem is that the white rice used in most Nasi Goreng recipes isn’t good for your gut. The grain-based fiber and the phytic acid have been removed when the rice was milled from brown rice into white. Cauliflower, on the other hand, is a seriously gut-healthy food. A study published in the Journal of Nutrition suggests that cruciferous vegetables, such as cauliflower, improve gut metabolism via their high soluble fiber content. Finally, in this healthier version of nasi goreng, we substituted margarine, which we hope you already know, is one of the unhealthiest food products you could consume, with ghee. Ghee contains the least amount of lactose and milk protein, making it a healthier alternative to ordinary butter and a better choice for those with dairy sensitivities. These healthy ingredient tweaks, paired with the vibrant spices of traditional Indonesian nasi goreng, and you have a delicious dinner recipe taht will make you and your gut happy. Prepare the cauliflower rice by placing all ingredients in a food processor. Pulse until you get a rice-like texture. Prepare the sambal sauce by mixing all ingredients together in a bowl. Add a tablespoon of water to thin. Set aside. In a saucepan, heat the coconut oil. Cook the cauliflower rice on low heat for 2-3 minutes. Fry the tempeh or eggs in ghee. If you don’t have ghee, you may substitute with coconut oil or a liquid cooking oil. Serve the cooked brown rice on a plate. Top with the tempeh then spread a generous serving of sambal sauce. Garnish with crushed cashews, chili slices, and coriander leaves. Make sure to SUBSCRIBE to our blog to never miss out on tasty and healthy recipes like these!